Christmas is coming!!! In 26 days to be exact. I absolutely love this time of the year; the celebration, the gifting, the food, the times with family and friends, the carols, the cocktails. It really is my favorite time of the year. When we first moved to Asia I found Christmastime really quite difficult because it just didn't have the same feeling for me as Christmas in the UK, the absence of the cold weather and the distance from my family were the main factors, but also the general feeling in Hong Kong at Christmas is very different. There are decorations and Christmas tunes playing but, because Christianity is a less represented religion in China, Christmas is a far less celebrated holiday in their culture. That said as the years have passed, and especially since Little Whisk was born, we have developed our own traditions and this year, in particular, I am feeling very festive! The week before Christmas we are hosting a small Christmas drinks party with friends and so I have been trying out some party food recipes. A savoury tart is always one of my go-to recipes for a party, my Bacon, Spinach and Stilton tart is another favourite and you can find the recipe here. Brie and cranberry is such a classic flavour combination and it works particularly well with the flaky, buttery pastry. I made this as a large tart but it would also work well as individual tartlets. 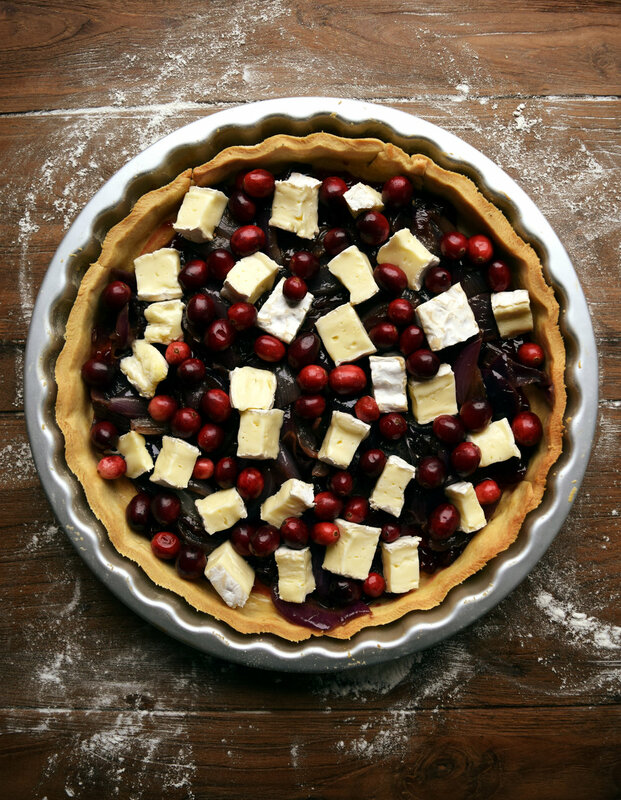 A festive tart filled with brie, cranberries and caramelised onions. First, make the pastry. If making by hand then rub the butter into the flour until the mixture resembles breadcrumbs and season with salt and pepper. Bind with enough cold water to bring the mixture together but not leave it wet or sticky. If making the pastry with a food processor then whizz the butter and flour until well combined and breadcrumb consistency. Then add the water very gradually whilst the food processor is going on the lowest setting. Add just enough water for the mixture to come together in a ball, and it will be able to be removed cleanly from the food processor in one lump. Wrap the ball of pastry in cling film and chill for 10 minutes. Once chilled, roll out until 2-3mm thick and line your flan dish. Prick all over with a fork, then wrap the entire flan dish in a tea towel and place in the freezer for 30 minutes, or if the flan is too big for your freezer then chill for 45 minutes. Preheat the oven to 200 degrees centigrade and blind bake the pastry for 10 - 15 minutes until starting to turn golden brown. Remove the baking beads, brush with the beaten egg and cook for another 10 minutes until the pastry case is cooked but not too dark brown. Remove the pastry case from the oven and set to one side to cool. Reduce the oven temperature to 180 degrees centigrade. Whilst the pastry is cooking you can make the caramelised onions. Melt the butter in a large frying pan, add the onions and some seasoning and stir to coat the onions in the butter. Fry on a low heat stirring occasionally until the onions soften, start to break down and caramelise. I normally cook the onions for between 45 minutes - 1 hour. Once the onions are nicely caramelised add the wine and vinegar and turn up the heat slightly to deglaze the pan. Allow to bubble for a few minutes until the liquid has reduced. Turn off the heat and put to one side to cool slightly. Once the pastry has cooled you can fill your tart. Spread the cranberry sauce over the base of the tart case followed by a layer of the caramelised onions. Put the fresh cranberries and brie on top, spread evenly over the tart. In a jug beat the eggs and then stir in the creme fraiche. Season with some salt and pepper and then pour the liquid mixture evenly over the brie and cranberries. Bake in the center of the oven for 30 - 40 minutes or until the tart is set and golden brown on top. Brie, Cranberrry and Caramelised Tart, perfect for the festive season.